NARRATIVE: On Wednesday December 17 at 1233, 6 Companies of Spokane Firefighters, 3 Engines, 1 Heavy Rescue, 2-Senior Ladders under the direction of Battalion Chiefs Craig Cornelius and Mike Inman responded to a reported structure fire at 1117 West 26th Avenue. The first fire company arrived within 4-minutes and found a one and one half story, single family wood frame home with light smoke showing from attached garage. Ladder companies searched and ventilated the home's basement. Engine companies were able to locate the fire in a daylight basement and extinguished it using pre-connected hose-lines. Through the process of attacking the fire, the Fire Department member was injured when he made contact with an energized electrical line. His injury was minor and he was transported to the hospital as a precaution. After being evaluated at the hospital, the member was released and returned back to work. The fire was contained to the area of origin and extinguished in 45 minutes. No civilians were injured in the fire. PROBABLE CAUSE: Under investigation by the SFD's SIU and listed as undetermined. DAMAGE EXTENT: Damage limited to the area of origin; smoke damage throughout the basement. .Install a smoke detector on every level of your home. Test smoke alarm batteries every month and change them at least once a year. Consider installing a 10 year lithium battery-powered smoke alarm, which is sealed so it cannot be tampered with or opened. .Make sure wood stoves are properly installed, away from combustible surfaces, have the proper floor support and adequate ventilation. Never use flammable liquids (such as gasoline) to start or accelerate fire. .Make sure your space heaters have an emergency shut off in case they tip over. Kerosene heaters are not permitted in many areas. ONLY use the fuel recommended by the manufacturer. Never refill a space heater while it is operating or still hot. Refuel outside, away from the house. .Have your furnace and chimney professionally inspected annually and cleaned if necessary. Chimney tar build-up is a common cause of chimney fires. .Never thaw frozen pipes with a blow torch or other open flame. Use hot water or a device, like a hand-held dryer, evaluated by a nationally recognized laboratory such as Underwriters Laboratories. (UL). .Dispose of hot ashes in metal containers placed away from the house. .Never use the range or oven to heat your home. .If there is a fire hydrant near your home, keep it clear of snow for easy access. PROBABLE CAUSE: Possibly caused by embers that escaped the fireplace through holes or cracks in the brick and mortar and lodged in the wall on the exterior side of the house. The fire is currently being investigated by the Special Investigation Unit of the Spokane Fire Department. DAMAGE EXTENT: The exterior vinyl and wood siding as well as the insulation and stud wall all received damage from the fire. NARRATIVE: On Monday, December 15, 2008 at 3:29 PM, 8 Companies of Spokane Firefighters, 4 Engines, 3 Senior Ladders and 1 Heavy Rescue under the direction of Battalion Chiefs Green and Hanna responded to a reported residence fire at 515 South Sheridan. Residents reported a fire present in the floor area of their home and called 911. They exited the residence at the direction of the Fire Dispatcher and were all accounted for on arrival of the first company. The resident's neighborhood fire company (Engine 7) was on scene within 5-minutes and reported a fire below the flooring of the home and believed that it may have spread to other areas of the home. Engine companies and Ladder companies working in concert located the fire, extinguished it and ventilated the home. The roof was laddered with Ladder 4's aerial ladder for rooftop access and they eventually overhauled and salvaged the remaining contents of the home. The well-coordinated efforts of the Spokane Firefighters resulted in the fire being extinguished within 30 minutes and damage being limited to specific areas of the home. There were no injuries to either civilians or firefighters and the residents are temporarily staying with family and being assisted by Spokane Fire Department's CARES Team and the Red Cross. PROBABLE CAUSE: The cause is under investigation by SFD's SIU. Preliminary information suggests a portable heating device may have contributed to the cause of the fire. A formal release regarding the cause may be disseminated tomorrow. DAMAGE EXTENT: Structural members and areas in close proximity to the fire are damaged. Minor smoke damage exists throughout the home. NARRATIVE: The Spokane City Fire Department dispatched fire fighting crews and their apparatus to 2503 W. Queen at 6:47 in the evening on Monday, December15th, for a reported basement fire. The first arriving fire officer reported heavy smoke issuing from the rear of a single story wood/frame dwelling, he reported that the family of four had safely exited the building and were outside, he further radioed to other arriving crews that he and his crew were going to attempt to enter the smoke filled building in an effort to locate the seat of the fire. Command of this fire was then transferred to the next arriving Fire Officer at the scene who made additional assignments to the other fire crews as they began arriving on scene. In a coordinated and systematic manner, the fire crews all went about completing their assigned tasks and as a result of their combined efforts the fire was located in the basement, it was confined, and then it was extinguished. The outside temperature created additional problems for the firefighters as they struggled in the single digit cold to fight this fire. Fortunately there were no reported injuries to any of the firefighters or to the family who was forced to leave their home. The family left the house with only the articles of clothing they happened to be wearing, however they were helped out by their neighbors who brought them warm clothing to ward off the bitter nighttime cold. The fire was contained to a bedroom in the basement which suffered very heavy fire damage, the rest of the basement sustained severe heat damage from the stubborn fire and the first floor of the house had considerable smoke damage throughout. 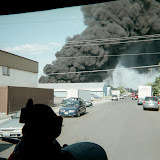 The on-duty investigator from the Spokane City Fire Department's Special Investigation Unit was on the scene shortly after the fire was extinguished and his investigation concluded with the cause of the fire being attributed to the incomplete extinguishment of incense that had been burning in one of the basement bedrooms. PROBABLE CAUSE: Incomplete extinguishment of burning incense in one of the basement bedrooms. DAMAGE EXTENT: Heavy fire damage to the room of origin, severe heat damage to the rest of the basement, and considerable smoke damage to the main floor of the residence. INCIDENT ADDRESS: 1031 E. 34th Ave. NARRATIVE: At 0415 this morning, Tuesday, December 16, 2008, the Spokane Fire Department responded to a reported house fire at 1031 E. 34th Ave. The first fire company arrived on-scene five minutes after the dispatch, and reported moderate smoke from the attic and roof vents. The occupants, one adult and two children, along with their dog, were out of the house. The adult reported being awakened by the smell of smoke, and got the rest of his family out. They did have an operating smoke detector in the home, but it did not activate for unknown reasons. Fire crews pulled ceilings in the kitchen and rear entry areas to get to the fire, which was burning in the ceiling framing members and attic insulation. The fire was quickly knocked down. Fire damage was confined to ceiling framing and electrical wiring, but damage due to accessing the fire and overhauling the burned area was extensive. The family will be unable to occupy the house until repairs can be made. PROBABLE CAUSE: The fire was investigated by Captain Smathers of the SFD Special Investigation Unit. He determined the cause to be electrical wiring in the attic. Further investigation will be done to determine if the wiring malfunctioned or was overloaded. DAMAGE EXTENT: Damage to the house is estimated to be $40,000. Thanks to Dan Renner for finding this!